Discover the differences between spray-in and drop-in bed liners. In commercials, your truck is hauling a bed-full of cinder blocks or towing a space shuttle. While that sounds epic, the reality is more likely you hauling a couch across town. And, there’s little glory in your buddy move a couch. Even something as benign as a sliding grocery bag acts like a sheet of sandpaper, scuffing your truck bed’s surface. Whether you have a short or long box, installing a bed liner protects the inside of the bed from damage and keeps cargo in its place. Now it comes down to choosing the right truck bed liner for you. Do you have a custom truck, or a drop-in liner simply doesn’t exist for your ride? No problem! With a spray-on bed liner, creating a custom coating is as easy as hosing down the bed and waiting for the layer to set. Preparation is the key to a perfect coating, so expect to spend time cleaning the bed before applying the liner. On the plus side, a spray-on liner lasts the life of your truck and only needs to be applied once. Once in place, this style of liner provides incredible protection and is extremely durable. If the extra time and elbow-grease of preparing the bed for a liner isn’t on your to-do list, a drop-in bed liner is perfect for you. Like the name implies, this liner is custom-molded for your truck and simply drops into your bed, providing easy-to-install protection. 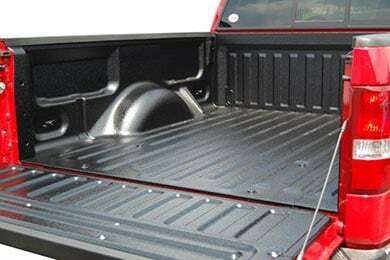 Unlike a cheesy bed mat found at stores, drop-in liners are custom-molded for your truck and allow the use of bed caps, for a clean, factory installed appearance. What’s the Right Truck Bed Liner for You? Both spray-on and drop-in liners provide excellent protection and add style to a boring ride. Consider a spray-on style to be the ultimate in custom liners, requiring additional prep-work and a fine attention to detail (to get an even coating). If you are after a simple installation with good protection, a drop-in liner is the no-fuss, no muss way to safeguard your bed. To see a good example of how a liner protects your truck, check out the bedrug reviews submitted by our customers. The installation process was really easy and I like the look of it. Would recommend to anyone. Reference # 762-666-579 © 2000-2019 AutoAnything, Inc.